Byzantine Coinage, c.950 to 1204AD. This paper will review the evolution of the main types of Byzantine coinage in the Middle Byzantine era (the core period of the New Varangian Guard), and ends with some notes on collecting these coins. The mainstay of the Byzantine economy from the earliest days was always the pure gold nomisma (Gk.='coin'), a small, thick coin struck at 72 from a Roman pound (327.45g) of gold. A slightly lighter (by one-twelfth), but otherwise identical gold coin was first struck under Nicephorus II (963-9). This was called the tetarteron nomisma (Gk.='(lacking) a quarter'), and the older coin became the histamenon nomisma (Gk.='full weight'). In practise, it was not important to distingush the two types as payments were made by weight, not number, of coins. During the reign of Basil II (976-1025) the histamenon became a larger, thinner coin (but keeping its original weight), then in the reign of Constantine IX (1042-55) it becarne scylphate (cup-shaped), both changes serving to distingush it from the tetarteron, which kept its old form. Beginning in the earlier reign of Michael IV (1034- 1041) the purity of Byzantine gold coins was gradually adulterated, falling to 26% by the accession of Alexius I in 1081, possibly reflecting the declining fortunes of the Empire following the death of Basil II - though an alternative view sees a need to get more coinage in circulation, due to an expanding economy. Silver coinage was uncommon in this period. A large, thin coin called the miliaresion (Gk.='one-thousandth'), was worth 12 to the histamenon. Two-thirds and one-third miliaresia were sometimes also struck. The follis was a heavy (from 6 to l5 grammes) copper piece, in those times worth 288 to the histamenon. The follis was the only common copper of the pre-1092 period, apart from small thick coins of uncertain value, minted at Cherson - production of the latter finished in the days of Basil II. 1 and 2 = histamenon nomisma and tetarteron nomisma of Isaac I (1057-9). 3 = miliaresion of Nicephorus II (963-9). 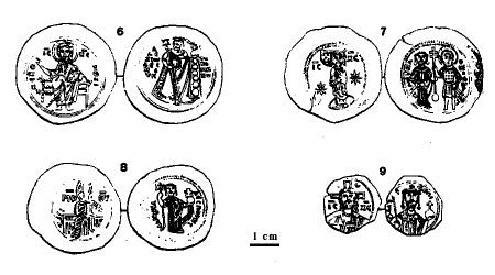 4 = 'anonymous' follis Class A2, attributed to Basil II (976-1025). 5 = cast copper coin of uncertain value, Cherson mint, John I (969-76). Both sides are shown. Alexius I Comnenus (1081-1118) revived the foundering Empire. Among many reforms he introduced an entirely new system of coinage in 1092. The foundation of this was a full-weight gold coin, the hyperpyron (Gk.='super-refined') of 85% (20.5K) fineness. This, as well as most of the other new coins, was large, thin, and cup-shaped. The lower denominations were the electrum aspron trachy (Gk.='white uneven'), worth one-third of the hyperpyron, and the billon aspron trachy, valued at 48 to the hyperpyron ('billon' is an alloy of silver and copper, 'electrum' of gold and silver). A small, thick copper coin, called tetarteron due to its resemblance to the defunct gold coin of the same name, is of uncertain value, but possibly equal to the old follis. After the time of the early Comneni the Empire was on the decline once again, and this is reflected in the precious metal content of coins, although the hyperpyron retained its purity until somewhat after the Latin Conquest. The silver content of the billon aspron trachy fell from ~7% to zero, and its value to 184 to the hyperpyron, by the end of the twelfth century. The electrum coin was also debased. Despite this, the Alexian reform coinage continued in use in the Byzantine successor states, as well as in the Latin Empire, well after 1204. 6 = hyperpyron of Alexius I (1081-1118). 7 = electrum aspron trachy of Manuel I (1143-80), showing St. Theodore. 8 = billon aspron trachy of Manuel I. 9 = copper tetarteron of Alexius I. Both sides are shown. It is not possible to cover these subjects in a short review. Interested readers are urged to consult the references below. 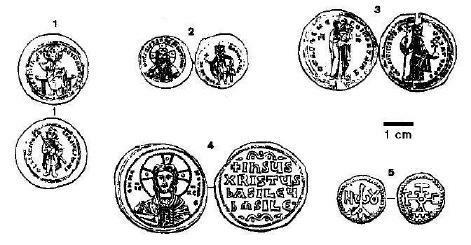 The subject matter of Byzantine coins is generally limited to the Imperial family and to religious subjects, notably Christ, but sometimes the Virgin, and in the days of the Comneni and their successors the Angeli, favoured saints. Coins are usually inscribed, most often with the name of the current Emperor(s) and a title, such as 'Emperor of the Romans' or an equivalent. Coins were not dated in the medieval Byzantine period. Religious formulae were favoured - especially "Jesus Christ - King of Kings" (see for example, Figure 1-4). This inscription, and the Cross, replaced the Imperial portrait on the so-called 'anonymous folles'of the 10th and 11th centuries. The value of an ancient coin primarily depends on its scarcity and state of preservation, far less on its metal content, and not at all on its age. The serious coin collector should be prepared to pay big money for Byzantine coins of good quality. However, the re-enactor who just wishes to own an artefact from his/her period of interest will find the lesser coinage quite affordable. Most commonly offered for sale in the lower end of the market are the abovementioned 'anonymous folles', and billon or copper aspron trachae of the twelfth century (and later, the Latin Empire). Worn but still identifiable coins can be had for as little as $15. Clear and attractive specimens of the commoner folles, including the 'anonymous' series, are priced from $50-70 and up. In general little care was taken in the striking of copper coins - the dies were often not correctly centered, and were used until they broke; coins were sometimes clipped to the correct weight; and old coins could be overstruck with a new Emperor's die. Consequently they are frequently blurred and of irregular outline, and the rare good specimen commands a high price. Silver, electrum and gold coins are rarer and much more expensive, expect to pay from $250 up. Most large coin shops carry a handful of Byzantine (and other medieval) coins. Another good source is the mail order auction, held by the Australian Numismatic Co. (see below). So, if the thought of handling what might have been Harald Hardrada's small change excites you, why not collect a coin or two? Grierson, P. (1982). Byzantine Coinage. Washington DC: Dumbarton Oaks. Sear, D.R. (1987). Byzantine Coins and their Values. 2nd ed. London: Seaby Ltd.
Whitting, P.D. (1973). Byzantine Coins. London: Barrie & Jenkins Ltd.
Australian Numismatic Co.: Address is 208 Sturt St. Ballarat VIC 3350. Catalogues are published 5-6 times per year, available by subscription. Byzantine coins on offer to tourists in Turkey and neighbouring countries are quite often fakes. Even genuine articles should be refused, as export of antiquities is ILLEGAL and penalised by law. Webbed by Peter Beatson, 1999-2000. All rights to materials herein belong to the original owners.